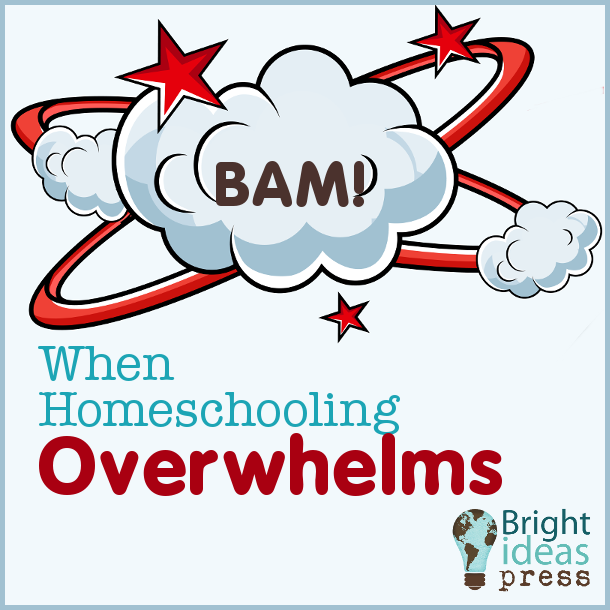 If you’re a homeschool mom, you’ve been there before — overwhelmed. It’s when you feel tired and worn out at the mere thought of tackling homeschool lessons. You find that on most days, you can’t even finish the lesson plans on the schedule. And then you wonder how you’ll manage to catch up. I’ve been there more times than I can count. It’s hard being in that position, wondering if you can keep going. When homeschooling becomes overwhelming, the first thing you need to do is take a step back. Put all the books away, and take a deep breath. You can’t reassess the situation if you’re drowning in the middle of it, trying to make it work. You already know that something isn’t working, but in order to pin point what the issue is, you need to step back and pray about it. Take this as an opportunity to reconnect with your children, your home, your husband, and yourself. Once you’re feeling refreshed, you are ready to take a look at the problem again. No two homeschool families look alike. No two homeschool families have the same schedules. It’s just not possible. We are all unique, and we need to tailor our homeschooling to our unique lifestyles. Don’t try and define your homeschool; let it take its own course and define itself. When we started homeschooling, I was sure that we were Charlotte Mason homeschoolers. I tried to define our curriculum based on that assumption, and it didn’t work. Once I set aside the mold mentality I felt comfortable exploring other resources. Now, I guess you would call us eclectic homeschoolers who lean Classical. I’m not even sure really, and, quite frankly, I’m okay not being sure about it. Whatever it is we do, it works great for us. Don’t try and keep up with the homeschoolers who appear to have it all together. I promise you, they don’t. Resources that work for them won’t necessarily work for you. It’s okay to break up with your curriculum that doesn’t work for you and your family. Limit your online go-to resources and homeschool blogs. In doing so, you’ll save yourself the pressure of keeping up with what everyone else is doing. I’ve had to breakup with several blogs and email subscriptions because they were just too overwhelming. I found myself wanting to do it all! And I tried to do it all too! This left me drained and insecure, causing nothing but chaos and discouragement. I love Pinterest. It’s like sitting down with a great magazine and discovering things you never knew existed! But for homeschoolers, it can be dangerous territory. Much as I mentioned earlier about narrowing down your online resources, proceed with caution when you log into Pinterest. Resist trying to do every science experiment and every tot-school activity you see. Don’t be afraid to outsource classes. There are several wonderful online classes for kids of all ages which offer live classes with teachers and other students. Not only will this be a fun experience for your children, but they’ll begin learning how to work more independently. Marlene is a wife to an amazing husband and a mom to three kiddos. Her days as spent homeschooling their kiddos in-between hugs and snuggles. In her not so spare time she enjoys crafting, painting (canvas not wall), or just relaxing with a cup of coffee and a good book. She loves the Lord and is passionate about living life diligently for Him in everything she does. You can connect with Marlene on her blog A Diligent Heart, Twitter, Google +, Facebook, and Pinterest.